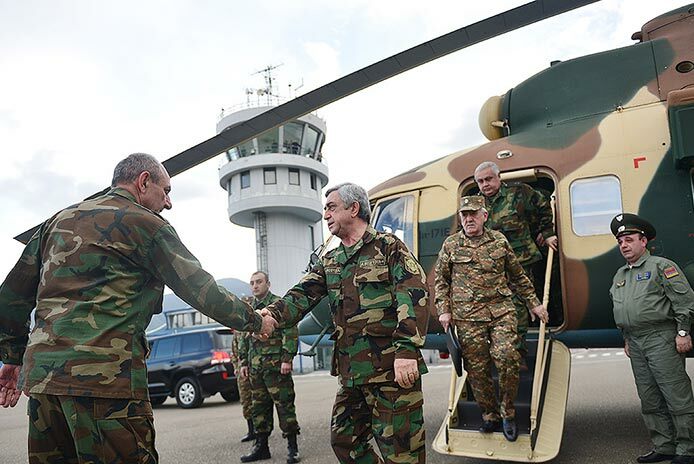 On Monday, Armenian President Serzh Sargsyan made his first trip to Nagorno-Karabakh after the four-day war there. While on a working visit to the second Armenian republic, Sargsyan, according to his press office, met with Nagorno-Karabakh Republic (NKR) President Bako Sahakyan, senior army officers for consultations. A wide range of issues related to army building was reportedly discussed. Sargsyan’s visit took place against the backdrop of Baku’s statements on the imminent resumption of negotiations on the Karabakh conflict settlement. In particular, on Monday, the Russian Tass news agency quoted Azeri presidential aide Ali Hasanov as saying that talks aimed at resolving the conflict could resume soon. “The proposal to resume negotiations was received from Moscow and now the negotiation process is being prepared. It is possible that intensive talks will start in the coming days,” said Hasanov. On April 5, when the Armenian and Azerbaijani sides reached a verbal agreement on ceasefire in the conflict zone after four days of deadly fighting, Russian President Vladimir Putin had phone conversations with his Armenian and Azerbaijani counterparts, Sargsyan and Ilham Aliyev, stating that Russia will do everything to contribute to the settlement of the conflict. On April 7, Russian Foreign Minister Sergey Lavrov in Baku made references to the so-called Kazan document – a 2011 effort by Russia to broker a solution to the Karabakh conflict one of the elements of which was the introduction of a peacekeeping contingent, likely a Russian one. On Monday, spokesman for Armenia’s president Vladimir Hakobyan told Russia’s RIA Novosti news agency that the Armenian side has not discussed with the OSCE Minsk Group the possibility and timing of a high-level meeting. These days there is also much talk about the possibility of Nagorno-Karabakh’s returning to the negotiating table. Nagorno-Karabakh was a full party to the 1994 ceasefire agreement, along with Armenia and Azerbaijan, but later it was left out of the peace process. In an interview with Russia’s Interfax on Monday the NKR president’s spokesperson David Babayan stated once again that no ultimate resolution of the conflict is impossible without Stepanakert. “It is impossible to find a comprehensive solution to the conflict without Nagorno-Karabakh’s participation. Azerbaijan at this stage will try to resolutely and persistently obstruct the participation of Nagorno-Karabakh in the negotiation process, but quite an interesting and paradoxical situation has been created. On the one hand, Azerbaijan is at war with us, but on the other hand, it does not want to negotiate with us and tries to impede the restoration of the full negotiation format,” Babayan said.